The fireplace is the focal point of the home and never more so than at Christmas time. The warmth and cosy glow from your fire draws everyone together for family time and where else would you gather on Christmas morning? Dressing the fireplace is all part of Christmas preparations and makes the most of your stove. Whether you are drawing the curtains tight and getting cosy or entertaining in style make your stove the focal point of your Christmas décor. We have chosen the best fireplace decorating ideas to turn your fire into something magical. Christmas wouldn’t be Christmas without a traditional stocking on the fireplace. Choose from a handmade knit, dazzling luxurious velvet or rustic hessian stockings. 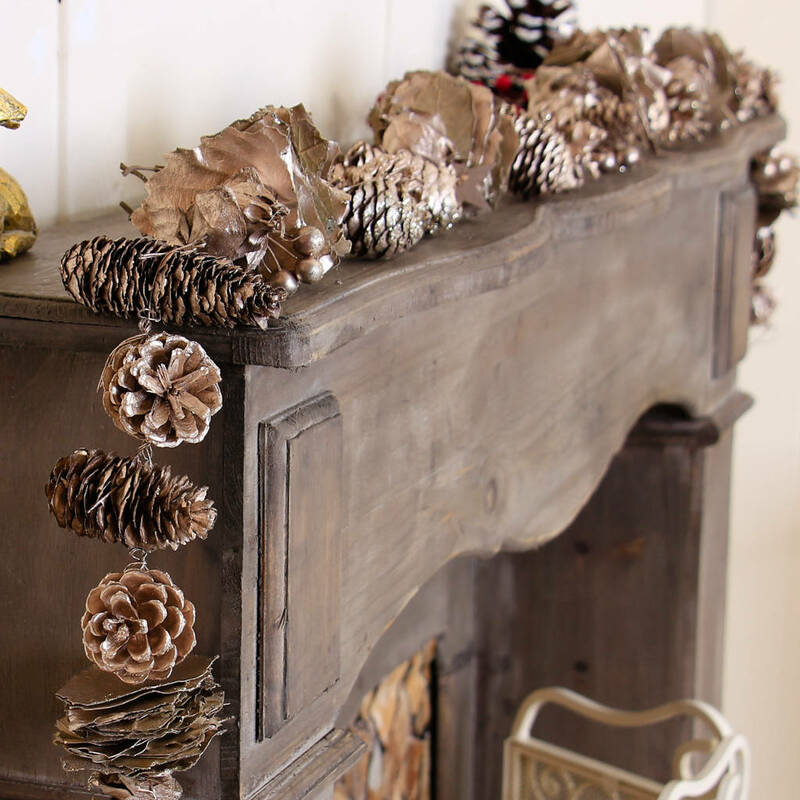 Compliment your theme and really dress up the mantel piece. 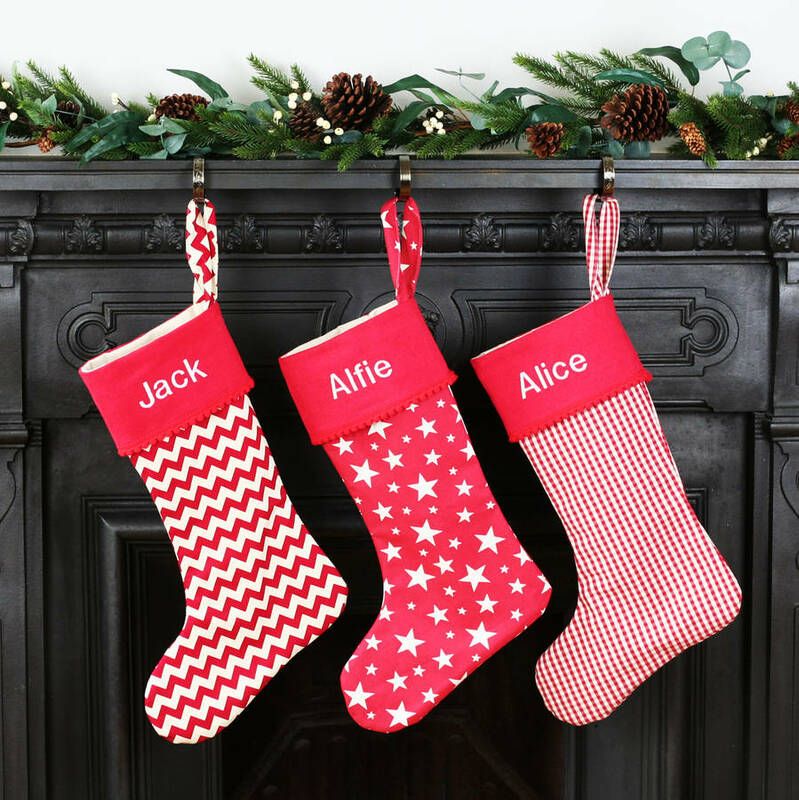 Family heirlooms are perfect or have some personalized stockings made and start the family tradition here. 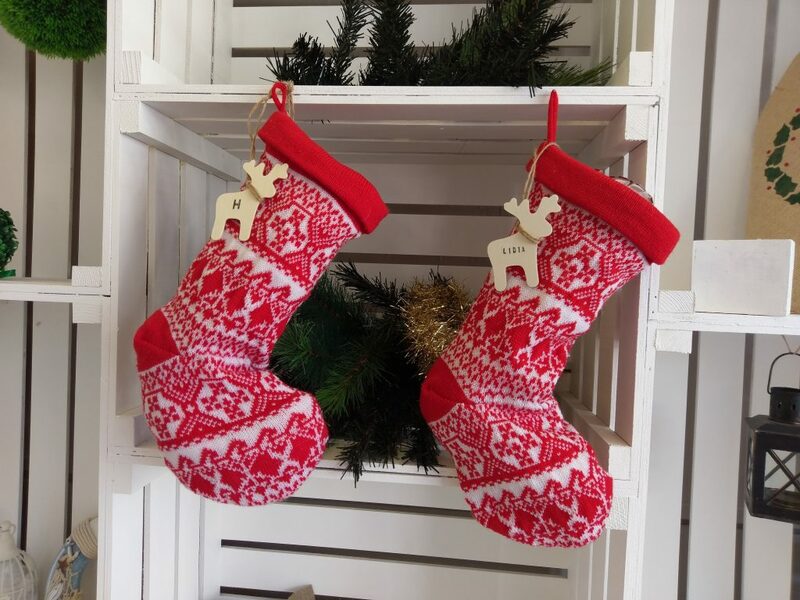 We love: Out of my bubble hand knitted stockings with festive snowflakes and reindeer. An essential accessory for hanging the stocking from the mantelpiece. We love Hide and seek’s antique brass clips. 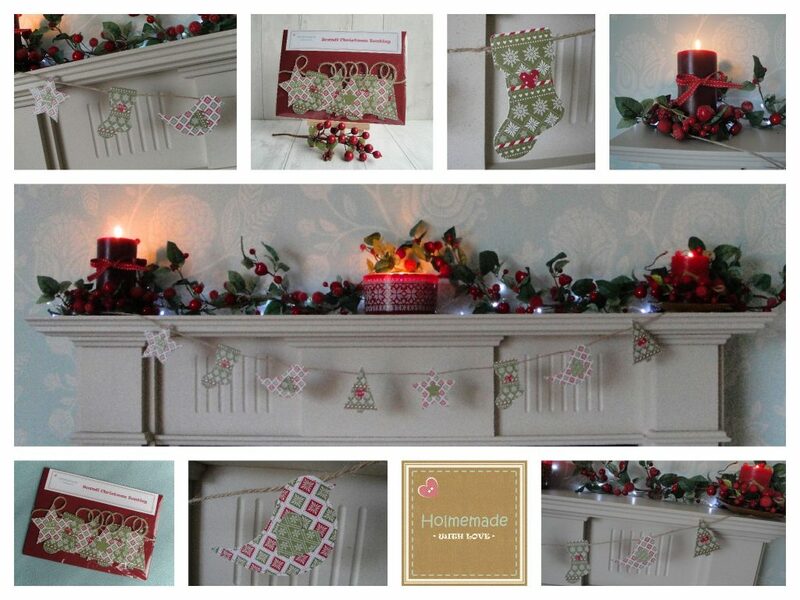 Christmas Bunting can add a homey touch to the fireplace. Handmade fabric adds the Hygge feel to your fire with a cosy rustic charm. Team a Scandinavian style bunting with natural foliage, candles and a stack of split logs. We love Homemade with love’s Scandi Christmas Bunting, in a Nordic style. Traditional, glitzy or rustic, the garland is a traditional fireplace accompaniment. Choose natural holly and berry with glossy foliage or string baubles and shiny lights from string. Hanging a garland from your stove surround is a stylish addition. Making your own evergreen garland could involve the whole family, collect the pine cones, evergreen foliage and berries and add opulent ribbon, bells and organza bows. We love Dibor woodland festive garland in champagne and gold. 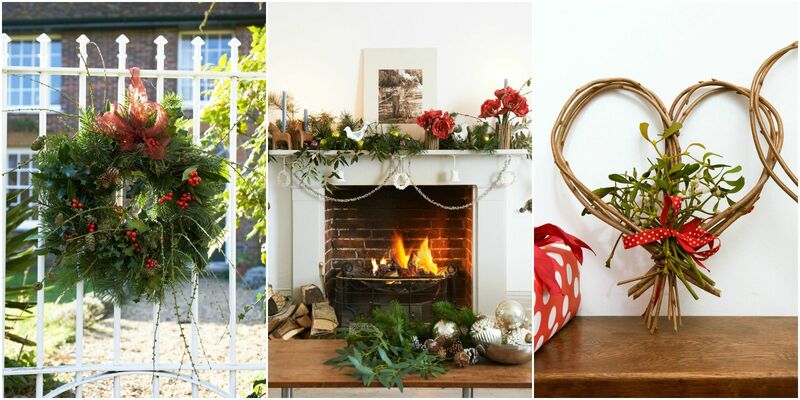 Christmas wreaths can create a focal point above the fire. Hang above the mantel, on the mantel piece or against a brick fire surround. Make your own if you have the craft skills or choose from a vast array. Wreaths come in all shapes and sizes and even include little lights to add an extra twinkle. 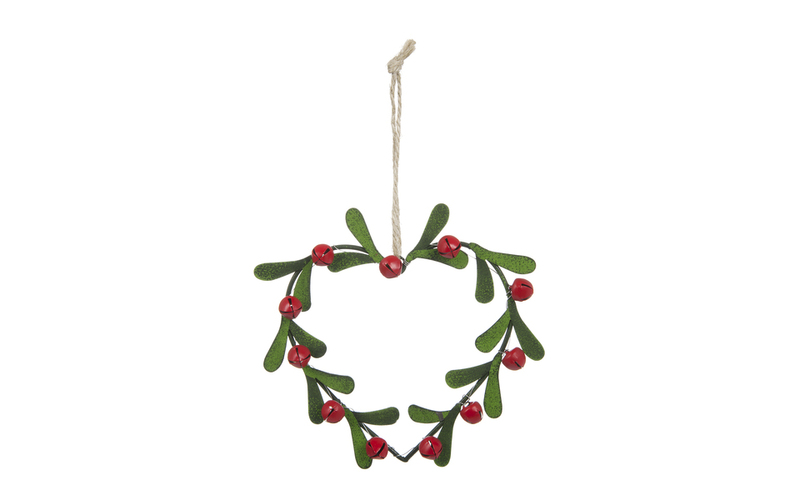 We love the simplicity of Laura Ashley’s mistletoe wreath with red berry bells. Your stove and the warm glow of candles are a perfect compliment. Place them on the hearth or on the mantel piece, the flickering glow will draw everyone in. A scented candle with a spicy Christmas aroma will blend beautifully with the smell of logs and pine tree. 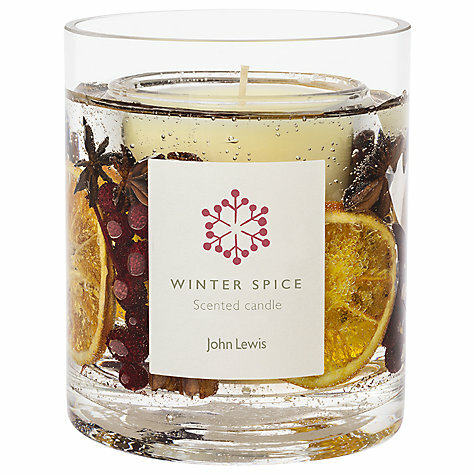 We love John Lewis’ Christmas candle collection with winter spices. 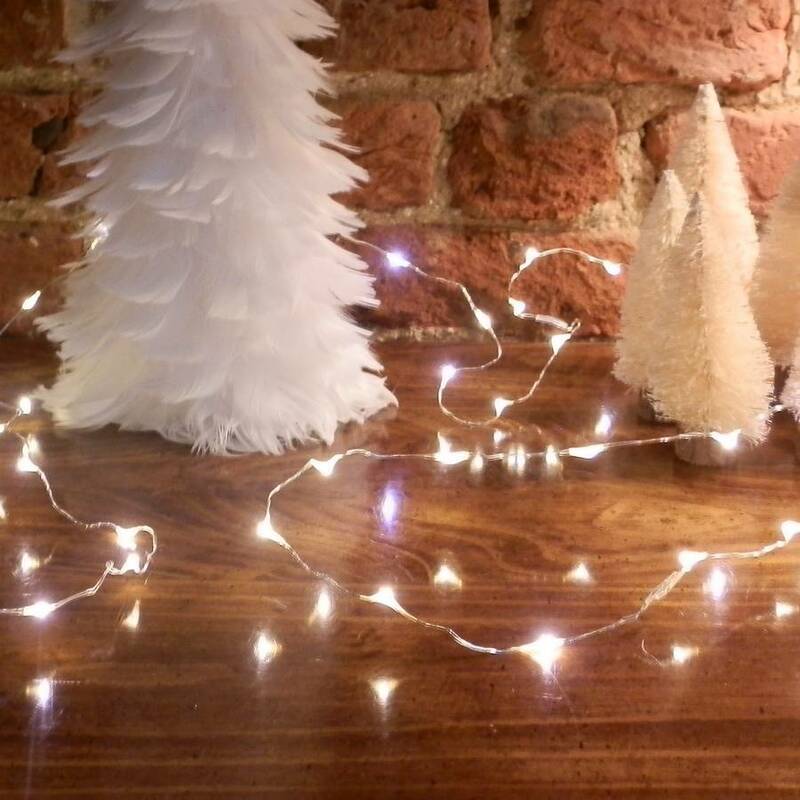 Compliment the lights on the tree with a string of sparkly fairy lights on the mantel or on the hearth. 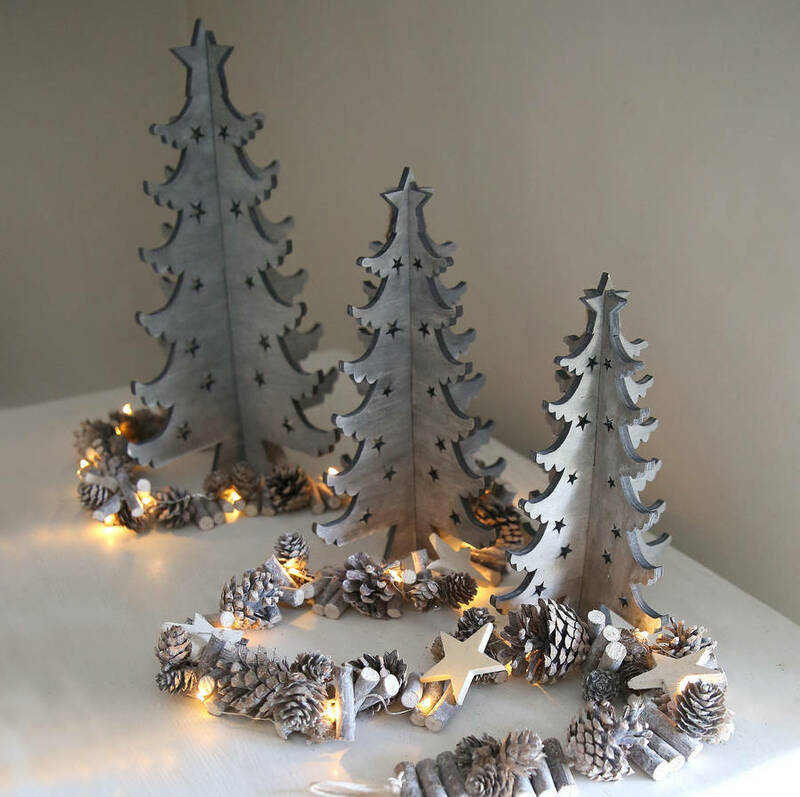 Place some natural foliage amongst the lights or entwine around Christmas ornaments, baubles or cards. From light up winter scenes to hand crafted tress and woodland creatures, the Christmas ornament is the cherry on the cake. Choose a grand ornament for the fireplace or arrange a winter scene on the mantel piece. Hygge has recently become talk of the town. Pronounced ‘hooga’, it is the Danish way of living that focuses on home, family and friends not things. Denmark has been consistently rated one of the happiest Countries in the world. They put this down to Hygge in large part. It is an atmosphere and experience. A cosy feeling of home. Creating a sanctuary with simple things that make us feel safe and comfortable. A heartwarming way of creating a space for optimum wellbeing. 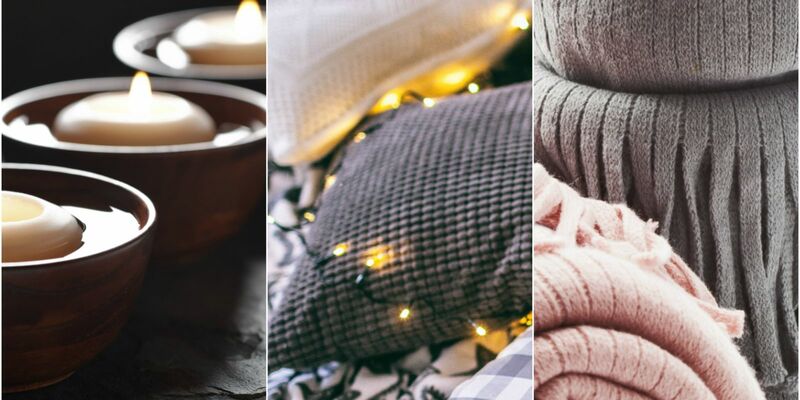 Hygge is in the heart and in the home. 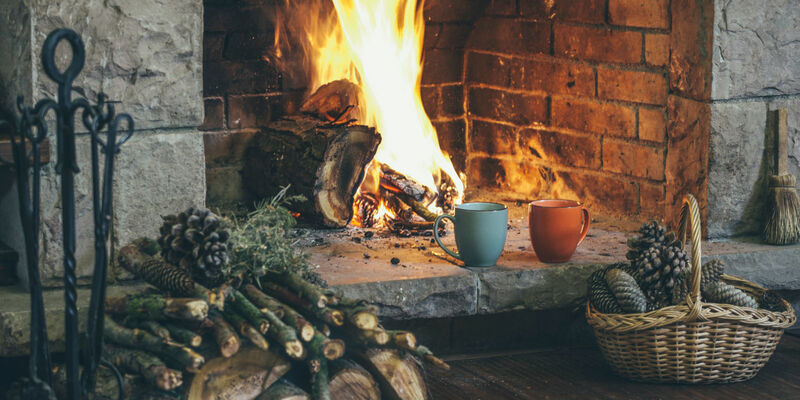 If you want to recreate a Hygge atmosphere in your home having a fireplace or stove puts you at a great advantage. 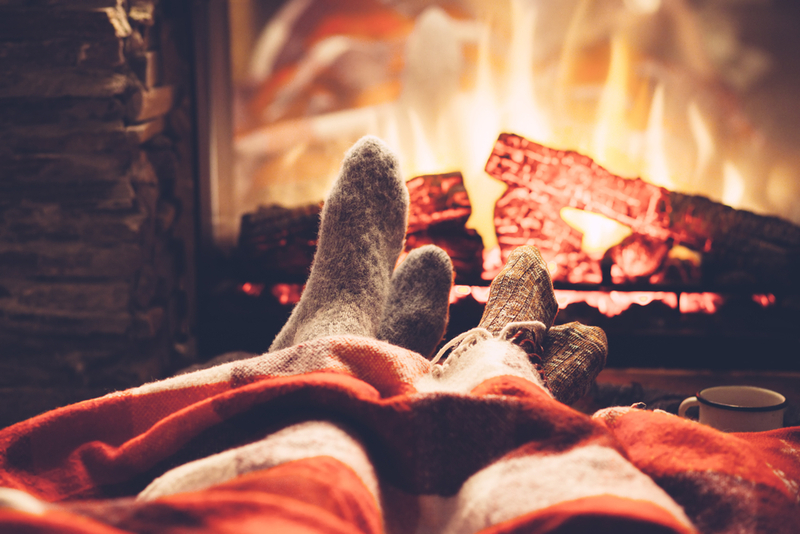 According to Meik Wiking, CEO of the happiness institute in Copenhagen, a fireplace is the headquarters of Hygge in the home. 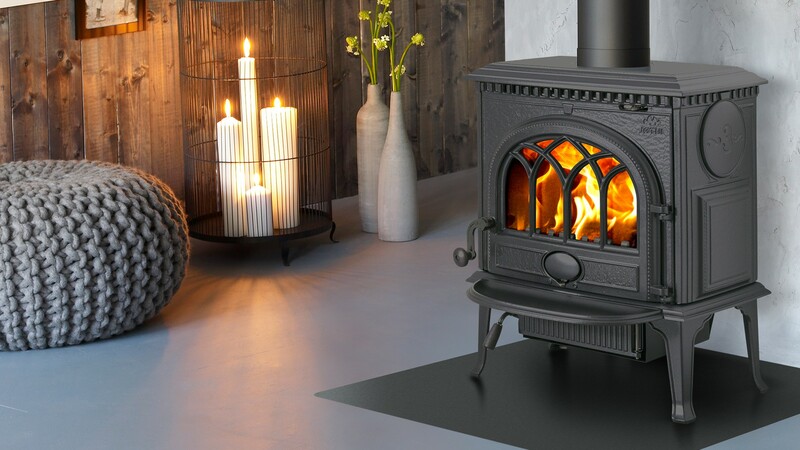 30% of Danes have a stove or fireplace compared to only 3.5% in the UK. Why? Because in Denmark they understand that home is where the hearth is. 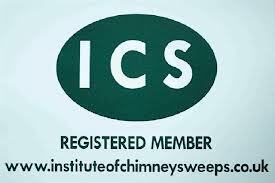 It is somewhere to be at the end of the day and unwind to the flickering flames. Somewhere to sit on a cold winters evening and experience ultimate feelings of warmth and cosiness. Its somewhere to sit with our loved ones and connect in a comforting warm glow. 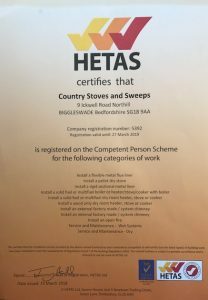 What else is on the essentials list that could make your stove space more Hygellig? 1. 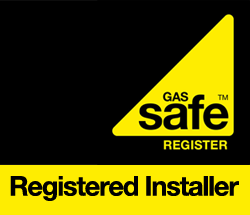 Candles – As essential as your wood burning stove. Placing candles on your hearth, mantelpiece or side tables enhances the mood lighting of your roaring fire. 2. Things made out of wood – Displaying your fire wood in a basket or as a beautiful stack is very hygge. Wooden candlesticks or ornaments, a small fireside table or bowl. Wood is simple and natural just like the concept of hygge. 3. 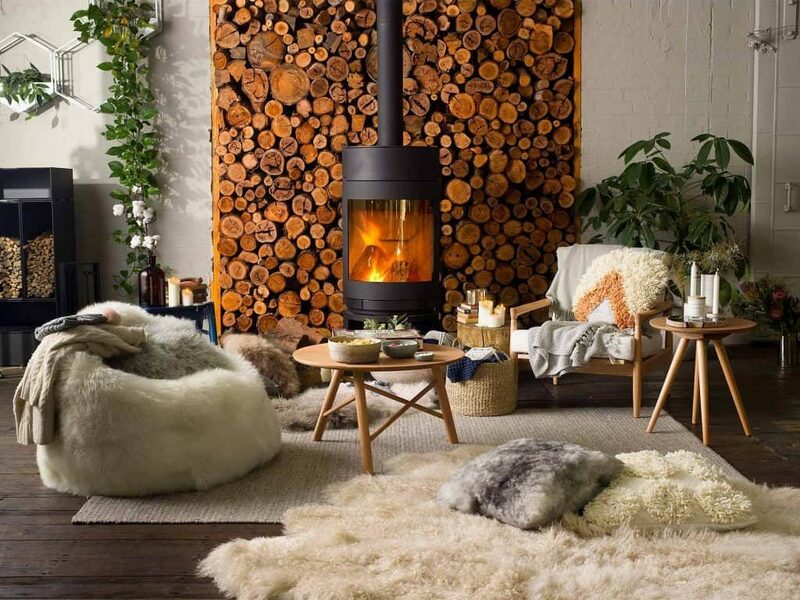 Nature – Any piece of nature to adorn your fireplace or fire room will get the hygge green light. Twigs, folage, flowers and plants as decoration will enhance the atmosphere. 6. Togetherness – Stove side is a great place to entertain with pre or post dinner drinks (candles lit). 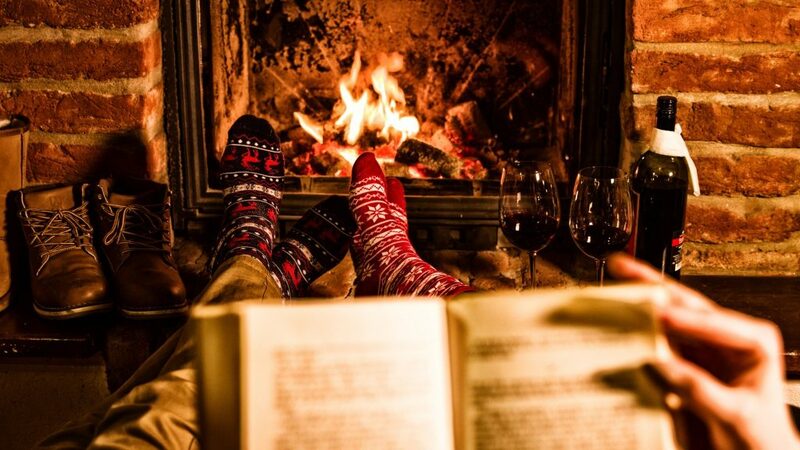 Plan a family card game or take your glass of wine around the fire and connect. 7. Lamps – A hygellig addition to your fireplace. Placing a few low lighting table lamps around your wood burning stove or floor lamps in the corner of the room adds to the atmosphere of warmth and comfort.